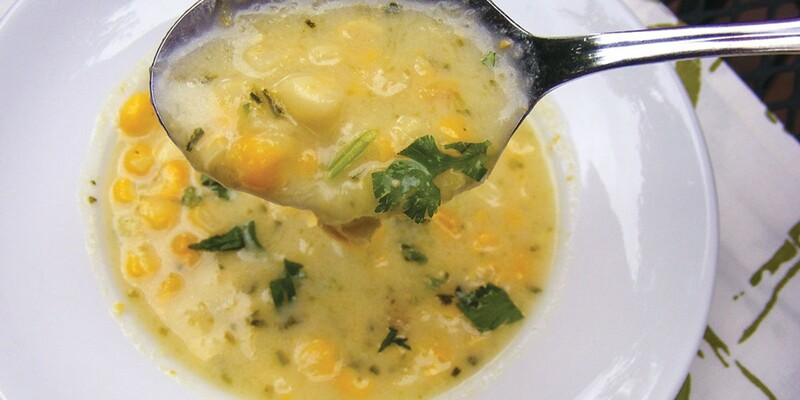 Andrea Juarez Mexican zucchini corn soup to warm up chilly summer nights. Your summer zucchini will shine in these two soup recipes perfect for a cool North Coast summer evening: sopa de calabacitas y elote, Mexican zucchini corn soup, and Peruvian caldo de gallina, chicken soup. The creamy zucchini corn soup was inspired by a gorgeous one I ate many, many years ago in Cuernavaca, Mexico. I was on an extended stay after I left my gig in Austin, Texas, to study and travel in Mexico. It was a life-changing experience. I lived part of the time with a local family and, lucky for me, in addition to improving my Spanish, I dined on some fantastic food. Josephina, the mujer de the casa (lady of the house) and my Spanish teacher, introduced me to a vast repertoire of Mexican cuisine. She made exquisite meals every day — sometimes with fancy ingredients and preparations and other times simple. Our main meal of the day was served early afternoon and almost always started with soup. One day she prepared a creamy zucchini soup that I immediately adored — simple, light and comforting. Her version was a pureed zucchini with stock and cream (which could easily be adapted from the recipe below). My version has additional texture from diced zucchini, plus fresh corn and cilantro. The second soup and one of my favorite soups is caldo de gallina con quinoa (chicken soup with quinoa). It was inspired by the first meal I ate in Cuzco, Peru. The city is the primary entry point for all the folks like me who set out to visit Machu Picchu and sits at about 11,000 feet in altitude, which means it gets chilly at night. The chicken soup was memorable, however the alpaca that I also ordered was not. The aji Amarillo chili in the recipe is a Peruvian chili with mild to moderate heat. It is standard in Peruvian cuisine and can be found ground in spice stores or in Hispanic markets. Last summer my local chili guy Dean Gilkerson from Earth-N-Hands offered plenty of variety. You can also substitute with jalapeños or other chilis. It's part of what makes this soup a brothy fix that will take away the chill, clear the head and sinuses (if you're battling a summer cold), and soothe your soul. This soup is packed with protein since it has chicken and the "Mother Grain," quinoa. If you like, add shrimp or white fish along with the corn and diced zucchini. Serves 4. In a medium stock pot over medium heat, add the olive oil and onions, and sauté until the onions become translucent. Add 4 cups of zucchini and sauté for several minutes until the zucchini barely start to brown and become tender. Add the garlic and sauté about 1 minute, stirring frequently so that it does not burn. Add the stock and salt. Bring it to a boil and reduce the heat to a simmer for about 10 minutes or until the zucchini is completely tender. Puree the sautéed mixture with a hand emulsifier (or blender —carefully in batches). In a medium bowl, mix about 1 cup of the pureed soup with the crema or cream. Mix well with a whisk or the emulsifier to incorporate. Slowly pour the creamy mixture to the soup, mixing well. Add the corn and finely diced zucchini, and simmer another 5 minutes until the zucchini are barely tender. Adjust the seasoning to taste. Serve hot or room temperature as a first course or side, garnished with fresh cilantro. For an extra elegant presentation, add a fresh zucchini flower. Rinse quinoa well and drain; prepare and measure all other ingredients in advance. In a large, heavy pot or Dutch oven, sauté the onion and celery in oil for 3 minutes. Add the garlic, aji Amarillo chili, cumin and oregano. Sauté for 1 minute. Add the chicken, water, salt, potatoes and quinoa. Bring the pot to a boil, cover and reduce the heat to medium. Skim off any foam. After the chicken has cooked (about 20 minutes), remove it and shred the meat with two forks. Set it aside, keeping it warm. Add the carrots to the soup and cook for 15 minutes until the potatoes are tender but intact and the quinoa is fluffy with its germs separated. Add the zucchini and lemon juice, then cook 10 minutes or until the zucchini are al dente. Return the shredded chicken to the pot and heat throughout. Serve hot, garnished with fresh cilantro.